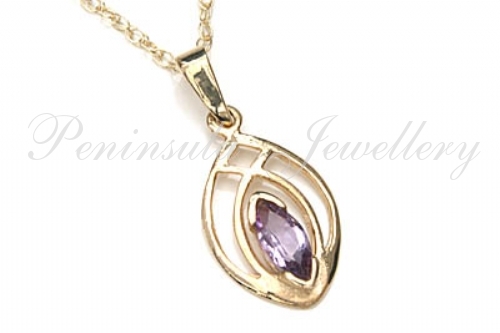 9ct gold pendant featuring a 6x3mm marquise cut Amethyst gemstone in a contemporary Celtic design. Overall dimensions: 10mm wide x 20mm long, including bail. Comes complete with a 9ct Gold 18 inch Prince of Wales chain. Made in England. Presented in a luxury gift box – Great Gift! !